Tooth fairy fun! Kids losing their teeth? Tooth fairy videos, tips, and tricks! There are several fun things to do when your child is about to lose their tooth, especially a first tooth. First is how your child takes the tooth out. Lots of fun creative ways to do that. Some people even film this event. Check below for tips on removal and some of the videos people area making of this event. Second is how the tooth fairy visits. 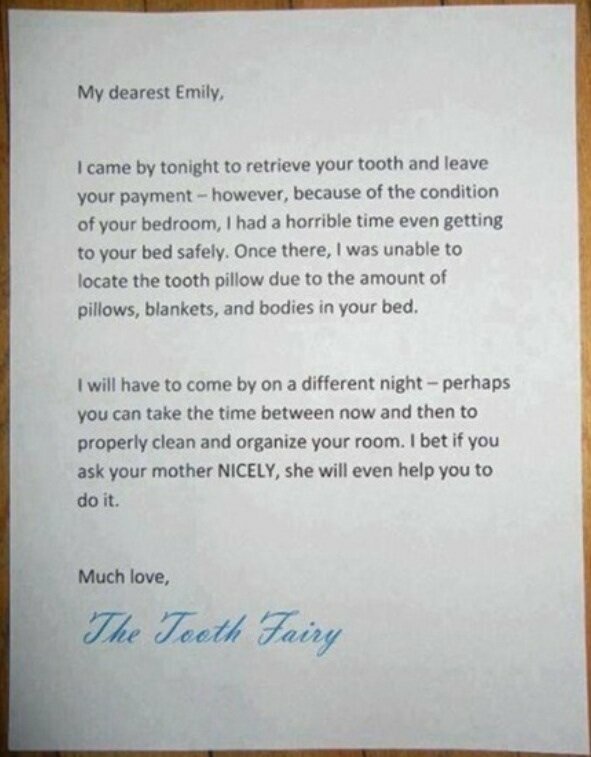 We think this is a neat little way to show your child that the tooth fairy came to visit. By the way, the tooth fairy is bringing between $2-5 usually and $3.70 seems to be an average. There is a tooth fairy tracker app, to let the kids know they need to get to bed soon or the tooth fairy may have to skip your house. A version of the following tooth fairy letter is probably one of the better motivators we’ve seen in a awhile. The biggest tip is to encourage your child to wiggle their loose tooth with their tongue! Some kids love to do this some don’t. Let them know it’s OK if it hurts just a little; that is normal. You can tell them to push it back and forth until it just starts to hurt and then hold it there for 5 seconds. Eating, and more particularly biting into anything hard, can get it out. Dr. Bryan lost his first tooth in a Taffy Apple and recalls thinking the apple hurt him so he put it back after he bit into it. Later his aunt found the tooth after taking a bite out of the Taffy Apple and spitting out what she initially thought was a really hard nut. Gross for her! BUT Taffy Apples and apples in general are a great way to get a front tooth out of a scared child. Have an adult or the child grab the tooth with gauze or a rough paper towel and wiggle it back and forth.